Going on outings into the community is part of everyday life, which is why we make it a priority at Marklund. Therapeutic Activity aides and volunteers take clients on outings several days a week, taking a few at a time, with the goal that each client goes out at least twice a month. Destinations vary from daily living routines like going to the grocery store, hair salon, bank, doctor or dentist, to fun actitivies like going bowling, to the movies, to see a play or go to church. Students in Marklund’s Day School and Life Skills Academy take field trips to area museums and even head over to the local pool for summer fun. Special overnight outings are arranged as well which allow clients to enjoy visits to the Marklund camp site in central Illinois, and even extended vacations to Walt Disney World. Clients are selected for specific outtings based on their individualized goals and abilities and are always accompanied by Marklund’s direct care staff. Transportation is provided via our specially designed buses. 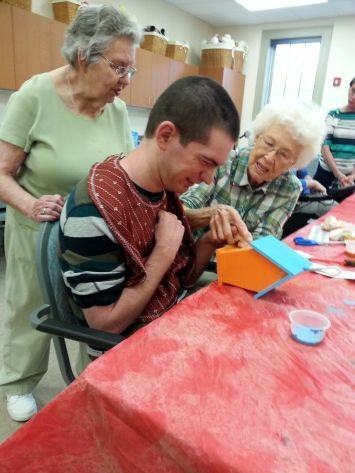 At right, client Jacob has fun painting birdhouses with residents at The Homstad Senior Living Center in Batavia.